Day-long breakaway survive frantic final chase from the peloton to deny the big-name sprinters. 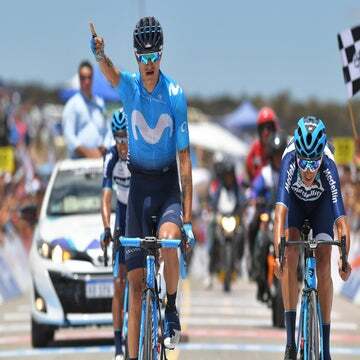 Germán Tivani of third-tier Argentinian team Agrupacion Virgen De Fatima sprinted to victory from a three-man break at Vuelta a San Juan stage 6, Saturday. 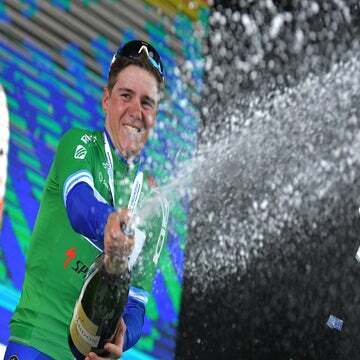 The 23-year-old was part of a race-long break that survived the flat 154-kilometer stage into Autódromo El Villicúm and held off a late chase from Bora-Hansgrohe, Movistar and Deceuninck-Quick-Step. A break comprised of Tivani, Daniel Zamora (also Agrupacion Virgen De Fatima), Dayer Quintana (Neri Sottoli – Selle Italia), and Daniel Diaz (Municipalidad de Pocito) went clear early in the race and built a gap of nearly five minutes. 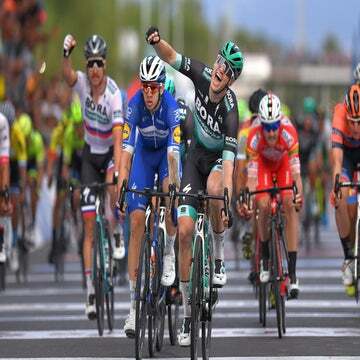 The WorldTour teams working for heavyweights such as Mark Cavendish (Team Dimension Data), Peter Sagan (Bora-Hansgrohe) and Gaviria looked to have the chase under control, however an unexpected tailwind late in the stage gave the break a glimmer of hope. With 20km to go, the quartet still had nearly three minutes, with Bora-Hansgrohe, Movistar and Deceuninck-Quick-Step pressing hard to close the gap. The escapees looked doomed when Quintana punctured with 10km to go, leaving just three men out front. However, the trio worked well together to hold a lead of around a minute with 5km remaining. With the relentless pace in the peloton, the bunch began to break up as the WorldTour teams began to panic. Teammates Tivani and Zamora worked well in the last 2km, with Zamora setting the pace, putting the pressure on a fatiguing Diaz. Tivani sat at the back of the trio as the race came to a close on the Autódromo El Villicúm race circuit, and launched himself to victory at the last moment, leaving Diaz in second and Zamora in third. Sam Bennett (Bora-Hansgrohe) led home the WorldTour chasers to take fourth, 12 seconds later. “We made a little mistake – us and the other teams – because we were going for the sprint but in the end we had to sacrifice everybody, otherwise we’d have pulled for nothing all day,” Sagan continued. Winner Anacona (Movistar) retains his 35-second lead over Julian Alaphilippe (Deceuninck-Quick-Step) in the GC, with one stage remaining, Sunday. Stage 7 will decide the GC in a circuit race around San Juan.